For all the frustrating aspects of California state government, one entity that I find to be very reliable is the Legislative Analyst Office (LAO). As usual, they have done a good job of responding to the Governor's budget proposal; particularly the proposed "trigger" cuts if voters do not approve a tax initiative that are targeted almost exclusively to education. Sen. Mark Leno, D-San Francisco, wondered whether the governor's scenario of cutting schools if the taxes fail is avoidable. Leno cited Brown's insistence that he set up his tax plan as such because schools consume so much of the state budget. Legislative Analyst Mac Taylor stopped him there. "They're 40 percent of the budget, not 90 percent. You don't have to do 90 percent schools. You can do a lesser amount. It's just that obviously there are tradeoffs." Alternatively,given the potentially unintended consequences of the trigger as well as the major disruptions caused by midyear reductions, the Legislature could consider building a budget without midyear cuts. In this case, the Legislature could focus on a funding level it could afford despite the revenue uncertainties and then use any ballot-measure revenue as one-time investments in 2012-13 to pay down existing Proposition 98 obligations. If you have heard me speaking in the past week, you know how much I really dislike the Governor's trigger cut proposal. It is completely different than the recent trigger cuts in this years budget. This year's trigger cuts were based on uncertain tax receipts in the short-run - something outside the control of voters or legislators - and were an understandable consequence of the deep cutting in this year's budget. The amount of the cut depended on the level of tax receipts, were of smaller magnitude, and distributed across programs. This "trigger" cut is much different, and that is why I have not hesitated to use stronger language than normal when describing them (even politically-loaded terms like hostage or ransom). Compared to the recent "trigger cuts", this cut is more than double the size, is all or nothing (as opposed to a sliding scale based on tax receipts), falls almost completely on one piece of the budget, and depends on an tax increase election on a very complicated Fall ballot. It is an ugly political threat, and would set a terrible precedent if successful. I am pleased to see the LAO pointing out the problems with this approach, and hope the legislature rejects the proposal. If it remains this way, I won't be voting for the Governor's tax initiative, and will take a serious look at Molly Munger's proposal as an alternative (even though the tax increase is too large in my opinion and I generally don't like dedicated revenue proposals.). Here is a link to a summary of our latest quarterly forecast. I just made $100 in "recreation related" expenditures in the Delta. Why didn't I have any fun? Made a run out at noon to CVS and to grab lunch. Picked up some shaving supplies, toiletries, and a few groceries and stopped for a sandwich. According to the PPIC, I just supported recreation-related employment. I didn't see any recreation products in the store (unless you count the family planning section), but I saw a lot of food. But the experts at the PPIC classify all this routine local retail and restaurant jobs as "recreation-related". For example, the description of the Delta secondary zone on page 26 notes: "relatively few jobs (1%) in agriculture forestry, or fishing... recreation-related activities (food and lodging establishments, marinas, other arts and recreation activities, and retail trade) account for 22 percent of employment in the secondary zone." If you break down that 22% (which the PPIC does not, but consult the DPC Economic Sustiainbility Plan or BLS, BEA, EDD and other govt sources), you will learn that roughly 10 percentage points is retail (the mall, groceries, etc.) and almost another 10 percentage points is restaurants (majority fast food), and marinas are too small to show up as a sector in most tabulations but are part of arts and recreation, of which the entire sector is smaller than agriculture. As noted in chapter 2 of the peer-reviewed Economic Sustainability Plan; the data clearly shows arts and recreation has the lowest relative employment concentration in the Delta (primary + secondary zone combined) of any of the 21 economic sub-sectors defined by the government's NAICS system. The notion advanced in the PPIC report that the legal Delta has a recreation oriented economy is false, it is wishful thinking and shameless pandering to the fictional narrative advanced by water export and habitat restorations interests. If you combine the small real recreation sector with the mall and McDonalds selling to locals, it looks big. The irony is that all that growth in so-called "recreation related" jobs that impresses the PPIC experts is generated by those housing developments in the Delta that they hate. Figure 6 illustrating recreation jobs in this new PPIC/Davis report is a wonderful example of how to mislead with graphs, and you will find no comparable groupings or graphs in any PPIC/Davis water reports on other regions. According to Figure 6, Recreation is more important than construction and manufacturing combined (goods producing non-farm), bigger than government employment, bigger than healthcare. Who knew? To be fair, later on in the report, they have a more reasonable estimate of Delta recreation that is significantly lower than their underestimated impact of agriculture (see previous post on that). There is more... especially on infrastructure and levees and salinity ... but I have to stop now and do other things. Kern County (highly dependent on Delta water) generates about 20% more agricultural revenue than the 5 Delta Counties combined. However, there are 4 times more farm proprietors in the 5 Delta Counties than Kern (about 9,000 vs 2,250 according to BEA which is based on tax returns). Comparing Kern County to San Joaquin County (by far the biggest Delta ag county) in the 2007 Census of Agriculture reveals that Kern County has 2,117 farms that average 1,116 acres. In contrast, San Joaquin County has 3,624 farms that average 204 acres. Ag receipts in Kern are about $4 billion a year, roughly double the $2 billion in San Joaquin. Kern County has nearly 3 times as many agricultural employees than San Joaquin County (45,000 vs 15,000), but about half the number of farm proprietors. Although their rhetoric is over the top, it does show that there is some truth behind Delta partisans portrayal of themselves as small family farms versus big "corporate" farms. Update: I eliminated some criticism of a recent PPIC report from this post. It had some miscalculations and was stronger than warranted, and distracted from the main point above. The Scenario Modeled in the New PPIC Delta Report Doesn't Look Anything Like the BDCP or the Delta Plan. 1. They assume water exports through a dual conveyance system will average 4.9 maf per year (see page 36 and 40) matching the 1980-2000 period. This is barely any increase over the constraints on through Delta pumping under the Biop. So, yes, under those operating assumptions dual conveyance would have a relatively small impact on Delta water quality. But does anyone really think that exporters will pay billions for conveyance that delivers 4.9 maf? My understanding is exporters have made it pretty clear that they won't, and draft BDCP documents and the superficial discussions of finance suggest substantially higher exports of 6 maf or possibly more. On page 40 they do note that some exporters are seeking 6 maf, but that is not what they modeled in their report. 2. 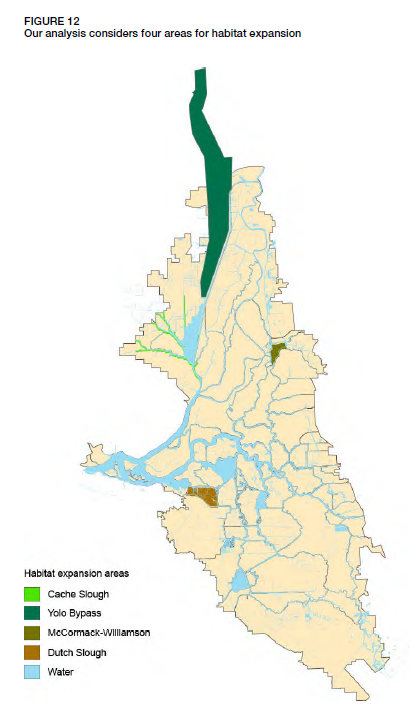 The baseline habitat resoration they are modeling doesn't include most of the tidal marsh or really any of the costly elements of the proposed BDCP or Delta Plan except for the Yolo Bypass enhancements. The picture is at the right. Does it look like BDCP or even any of the other PPIC Delta reports? In Table 1, note that there is no loss for habitat conversion in all of San Joaquin County (the majority of Delta ag) and virtually none for Solano County (the Cache slough area). So if there is no water quality degradation and no tidal marsh, the economic costs to the Delta can be manageable. That is exactly what the DPC Economic Sustainability Plan recommends, and if you added a south San Joaquin bypass around Paradise Cut to the picture at right, it would pretty closely match the ESP recommendation for habitat. But that is not what the BDCP, DWR, other PPIC reports, and the Delta Plan are talking about. PPIC should be more clear about what they are modeling, because the language they use in their summary makes it sound as if they find current policy proposals (which are BDCP and Delta Plan) have only a 1% impact on the Delta economy (15% in the primary zone). That's not true, unless these plans have undergone some dramatic recent changes. It should also be noted that some significant infrastructure related impacts aren't considered. But I will leave that and discussion of more technical economic issues for another time and forum, and after I have had more time to digest what they have done. Some of it is pretty good, and not much different than our own work. This post is an initial impression from a quick read. First Take on Brown's Budget Proposal: Are School Trigger Cuts Ransom? Interesting afternoon and press conference surrounding the Governor's new budget proposal. The headline on the budget is nearly $5 billion in mid-year "trigger" cuts to education if the Governor's proposed tax initiative doesn't pass in November. In response to questions about tying his tax proposal to large education cuts, called "ransom" by Dan Schnur, the education cuts were defended by Brown because "that is where the money is." Looks more like ransom to me and I don't like the tactic. If that is where the money is, because that is where he put the funding increases in his budget. In the base budget that assumes the tax increases pass, K-12 education is most of the increased funding, nearly $5 billion, almost the same amount cut mid-year if the tax initiative were not to pass. Education may be the biggest budget item, about 40%, but it is 90% of the trigger cuts tied to the tax vote. I would rather see the budget keep education funding flat and not assume the tax increase. My amateur political science guess is that part of the reason for this structure is to convince proponents of some of the other tax initiative proposals to pull their competing initiatives off the ballot; in addition to the fact that the ransom strategy might be effective in getting people to vote. It will work on my wife and probably will work on me too since my kids will be lobbying me to. And this tax proposal is marginally better and smaller than the tax extensions he was pushing last year that I opposed. I have to wonder about the seriousness of ransom threat. As a practical matter, I don't really see how a mid-year budget cut of this magnitude could be implemented, and really don't envy school administrators that have to budget and plan for this. This mid-year cut (or perhaps better described as taking back the increase) of $5 billion is orders of magnitude larger than the worst case scenario envisioned this year, and is almost 10% of education spending. If I were writing a school budget, I would base it on pretty flat spending with a large reserve rather than count on a 10% increase, but that could be difficult to do if it is in the budget and there are a lot of pressing needs. The economic and revenue forecasts underlying the budget seem pretty reasonable so I wouldn't count on budget help there, although there are probably more forecasters who will view it as overly pessimistic than too optimistic. Friday Update: It didn't take long for Chris Thornburg to call the revenue forecast "bizarrely low" today consistent with the paragraph above predicting that some economists will see the forecast as too conservative. I don't see it that way, but Chris makes a good argument for stronger growth.